No. 1 favorite Saturnalia pulled away from a tight pack of contenders to win the Satsuki-sho, the last Japanese Classic of the Heisei era, on Sunday. Saturnalia, ridden by French jockey Christophe Lemaire, edged fourth pick Velox by a head at Nakayama Racecourse and Danon Kingly a nose further behind. The winning time was 1 minute, 58.1 seconds. Saturnalia, who has won all three career starts including the G1 Hopeful Stakes in December before he went on a three-and-a-half month break, became the first unbeaten horse since Deep Impact in 2005 to win the 2,000-meter turf race for 3-year-olds. “I had a good feeling since we were in training and I was confident all along,” Lemaire said. 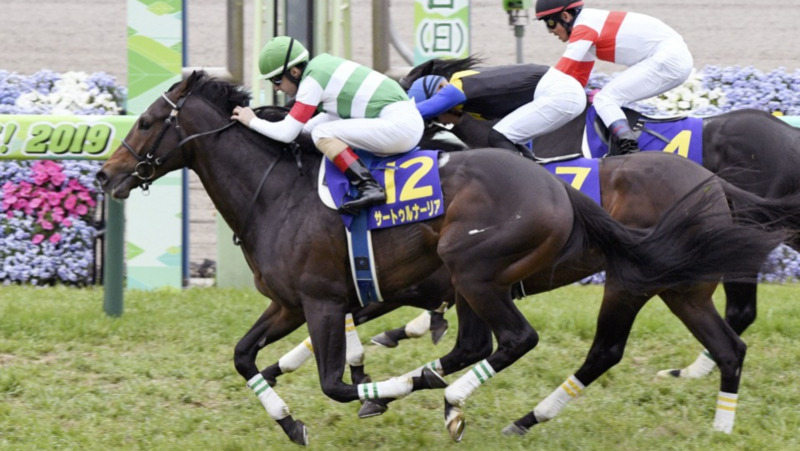 “The horse wasn’t in 100 percent condition because he was coming off a break but I hope he’ll be in perfect shape at the (Japanese) Derby,” he said of the second leg of Japan’s Triple Crown on May 26. The current Heisei era ends April 30, and Japan will enter the next imperial era, Reiwa, on May 1.